While much of the U.S. has been dealing with severe winter weather, California is experiencing a record dry spell. The clear skies have also brought some cold nights and, with them, wood smoke. What I’ve noticed in my neighborhood is that the desire for a cozy wood fire cuts across political lines. And as the local air quality authority has called a record number of no-burn days due to poor air quality (high levels of PM 2.5, the fine particulates that can get through the respiratory system and lodge in lungs), the anger at restrictions on those cozy fires has also cut across political lines. Many of these neighbors are friends of mine. They are caring people who recycle their newspapers and bring home their groceries in reusable bags. Most are concerned about pollution in general and believe that greenhouse gases are causing potentially devastating climate change. Yet, they ignore warnings about the pollution from their wood fires, in some cases even blatantly violating the burning bans that have been called on nearly half of all days in the bay area since November 1. The science on local particulate air pollution is settled – both that wood fires are the primary source in winter and that the health threat is significant. And it takes much less imagination to understand the danger from wood smoke than the danger from carbon dioxide and other greenhouse gases. Particulates are visible in higher concentrations and your nose, eyes and throat tell you that there is a problem with the air. GHGs are invisible and odorless. Addressing the wood smoke problem does not require a fundamental shift in the way we live. Sure there is a sacrifice -– even I enjoy a wood fire on occasion -– but it doesn’t mean living in a colder house, traveling less, reducing electricity consumption or anything else that has a broad impact on standard of living. The houses around me already have natural gas furnaces that are a less-expensive way to heat. Yet, judging from news reports, letters to the editor in the local papers, and discussions with my neighbors, there is widespread resentment that the air quality district is restricting wood fires. Many of the excuses are of the “my contribution is so small it doesn’t matter” variety. One recent letter in the local paper dismissed policies that are designed to reduce pollutants so small that they aren’t even visible, a “what I can’t see couldn’t be that dangerous” attitude that I bet is more widespread that we’d like to admit. My point here is not to scold my neighbors. I think they are just as public-spirited as other people. What I take away from this is that people have a strong ability to deny uncomfortable truths about pollution (and externalities more broadly) when the implication is that they need to change the way they live, even if the change is fairly small. The changes we will have to make to address climate change are going to be much more challenging than just substituting a cleaner, easier and cheaper heating source for a dirtier one that is also a hassle to use. This realization has helped move me in the last few years to argue for much greater emphasis on subsidies for R&D to reduce the cost of substitutes for fossil fuel. The renewables advocates are right that we have the technology today to address climate change, but we don’t have the technology to address climate change without sacrifice. There are people who will voluntarily sacrifice to reduce their pollution, but that’s not most people. Even among the upper middle-class households in my neighborhood (by world standards, quite wealthy), most people react by denying the problem or denying their ability to have any impact on it. Broad support for national or international strategies to reduce carbon emissions quickly dissipates if those policies turn out to be expensive (see Spain’s abandoning renewable subsidies) or if other priorities come to the fore (see how Germany’s decision to ditch nuclear power has led to increased coal-fired generation). In the developing world, where incomes are much lower and the other threats to life are more immediate, sustained support for more-expensive alternative technologies will almost certainly be even more scarce. Digital photography destroyed the film industry without a murmur of government intervention. If the shift had been due to expensive regulations on film (even if they were good public policy), we’d still be getting our photos developed at the local drug store. With apologies to Donald Rumsfeld (now there’s a phrase I didn’t ever imagine I’d be writing), we have to go to war against climate change with the human and political constraints that exist, not the benevolence, rationality, and far-sightedness that we wish existed. « Is it unconstitutional for the President to implement major new policies by regulation? I live in a very small town. Ppl around here burn just about anything. and get away with it. I have rung up the local council in my area and complained about smoke coming inside my house and making me sicker than i already am. I am an old person with severe re-flux and a shrinking oesophagus and so far i have had no luck talking to the local council. The lady i have spoken to has told me that i need to know which house the smoke is coming from. All i ask in life is that i have clean air to breathe in my own home. Is this too much to ask? apparently it is too much to ask. There are many houses surrounding me and at night when ppl light their firres around here you can not see the smoke. No one gives a damn around here about sick old ppl getting sicker from the stinking wood fire smoke. I wish wood fire heaters would be banned everywhere and not just in urban areas. It needs to be banned especially in rural areas because ppl that live in rural areas burn anything as i said. Or they let their fires burn on low nearly all the time and when the wind blows it makes the smoke even worse especially when ppls fires are burning on low all the time. It stinks out the entire town. Teresa Moreno, a researcher from the IDAEA (CSIC) and lead author of a study that has been published this week in the Journal of Hazardous Materials, told SINC that “people who live in cities already inhale significant amounts of contaminant particles stemming from traffic emissions, chimneys and cigarettes, and the dense smoke caused by fireworks only worsens this situation. In order to obtain colorful fireworks, metals are added to the gunpowder, and when a fireworks explodes, it releases a lot of smoke, along with minute metallic particles, of a few microns in size, or even less, small enough to be inhaled deeply into the lungs. Moreno explains that “this poses a risk to health, and the effects are probably more acute in people with a background of asthma or cardiovascular problems. And as fireworks are completely legal and will probably not be banned sometime in the near future, all spectators should keep their distance and pay attention to the direction of the wind. So is the issue with burning of wood and plywood sheets. Researchers also recommend that fireworks display should be sited so that the plume of smoke won’t reach densely populated areas. Professor Borenstein is absolutely correct. Many “green” people in Berkeley are driving a Prius, recycling their bottles and cans, and generating carcinogenic smoke equivalent of 12,000 packs of cigarettes by burning 3 hours or more of wood smoke on 20-50 nights a year.That is equal to about 600,000 packs of cigarettes! 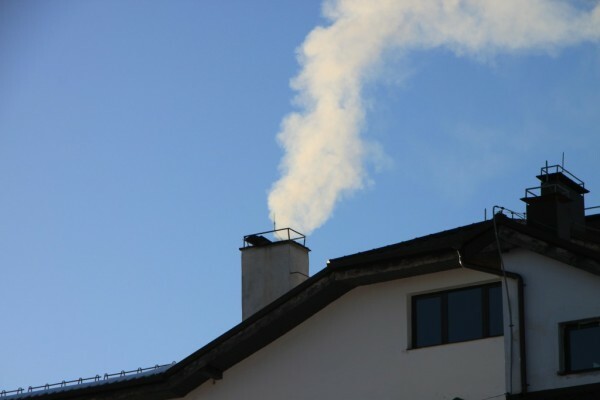 Wood smoke pollution not just a winter problem. There is a severe smoke pollution problem currently plaguing Alameda that, unfortunately, has yet to be addressed by local elected officials, or adequately by the regional air-quality board, for that matter – that is wood smoke pollution. Many of us associate the warm months with the woodsy, natural smell of wood burning as we indulge in our hobby of backyard cooking with wood based products – charcoal, meat smokers, and wood chips used with gas grills. We may even enjoy a summer evening gathered around small wood burning fireplaces – Chimineas, for example. In Alameda, wood smoke pollution is a greater problem in the warm months, than during the winter. I have found that no weather condition can guarantee that wood smoke pollution will not fill my neighborhood, and the proliferation of backyard grillers and smokers has produced an almost non-stop wood smoke pollution problem literally 24/7, 365 days per year. Alameda stinks in both residential and commercial areas all year round. I would love a follow-up on the ongoing risks to human health and the environment created by wood burning. Any source, any time of year. Curious, but well-meaning, and persuasive post. Had no idea, as I live in the Midwest, despite friends and family in your area, that such a ban was in effect. It is interesting that so many would turn to wood-burning stoves, and fireplaces, in cool weather in the Bay. Anyone who has built fires–inside or out, for heat, cooking, trash incineration, or the primal pleasure of simply being close to them–knows that burning wood is highly polluting, and difficult for those in the immediate vicinity, as well as on general air quality. One near neighbor here likes an occasional fire in her fireplace; I can tell very quickly when she is burning wood simply by the smell, not unpleasant but sometimes irritating, in the air. It is difficult to imagine just how irritating our local air might be if many of my neighbors decided to make fires…! This is a curious situation; the Bay Area is generally associated with higher than normal levels of awareness of environmental issues. Why are people doing this? Should not driving be similarly restricted? Don’t volcanoes emit much more air pollution than our fireplaces? And haven’t volcanoes been erupting since the beginning of time? How has the climate been able to manage all these years? UCB Staff, I think you’re asking the wrong questions. The climate will manage, we’re concerned about humans here. 1) What type of climates are manageable for Humans and the biological systems supporting them? 2) What times in earth’s volcanic history would humans have been able to survive? 4) At what point does ANY contribution to air particulate matter become material for human health and longevity? Go, keep asking, make informed decisions! There is no such thing as an EPA-approved “clean burning” wood stove. They do reduce the volume of carcinogenic pollutants somewhat, but people tend to continue to burn improperly, so that bit of advantage is lost. Within a few months of use they also lose much of the advantage of reduction of pollutants. Fifty-seventy percent of the smoke finds its way into the neighbors house also. Wood smoke is toxic we need to accept this and move on to cleaner fuels. Your bias is showing. Capable folks can maintain a wood stove properly and burn fuel with secondary combustion for optimum performance. It ain’t rocket science. Open wood-fire cooking is all the rage, yet you neglect to mention the inherent hypocrisy in exempting restaurants from Spare the Air Day restrictions. what advice do social scientists have for the human race that will motivate us to work together to protect the planet so that all of our descendants will have an acceptable quality of life?